Whirlpool® 27 cu. ft. French Door Refrigerator with the Most Fresh Food Capacity Available also features MicroEdge™ shelves, In-Door-Ice® system. Triple Crisper system and more. Total 26.8 cu. ft. / 0.76 cu. 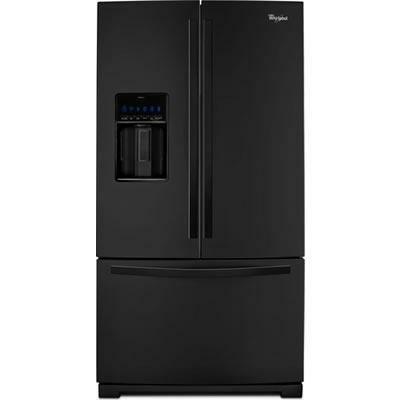 m.
Refrigerator 19.03 cu. ft. / 0.54 cu. m.
Freezer 7.77 cu. ft. / 0.22 cu. m.
Technologies MicroEdge™ shelves; Temperature-controlled full-width pantry; Triple Crisper system; Freezer Divider; 11-point ramp-up white LED lighting; Exterior filtered water dispenser with Tap Touch controls; Measured Fill; Fast Ice option; FreshFlow™ Produce Preserver; Adaptive Defrost; FreshFlow™ air filter; Pizza Pocket; Fold-away shelf; PUR® water filtration system.